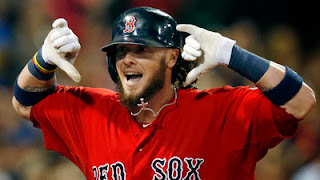 According to NESN, Jarrod Saltalamacchia is surprised at the lack of contract offer from the Red Sox organization. The Red Sox did not make Salty a qualifying offer yesterday, but make one to Jacoby Ellsbury, Stephen Drew, and Mike Napoli. According to NESN, Salty said other clubs have already been in touch. Salty also added that he thought he was on the same page as the Red Sox organization. Things could still change, but Salty has shown a lot of improvement since coming over in 2010 at the trade deadline. He did have his struggles in the postseason, resulting in him being benched in favor of David Ross. Saltamacchia says that his preference is to remain here in Boston, according to NESN, but his future is unclear. Should we keep Salty or let him walk? Let me know on Twitter (@ConorJF1016) or leave a comment.